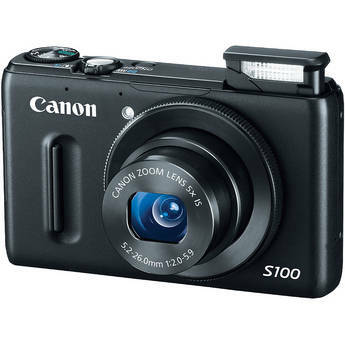 Home / Canon’s New S100: A shirt-pocket camera to drool over! It’s a 12MP camera with an f/2.0 lens that captures full 1080p HD Video with stereo sound, and supports ISOs up to 6400, all packed into a 6 oz. package! It includes a reasonable (for a point and shoot) pop-up flash, and just about every feature you could want except for an optical viewfinder (an endangered species on cameras this size). It features a good general purpose 5x zoom (24-120mm 35mm equivalent), which is an excellent range for a camera with this fast a lens that isn’t going to bulk up your pockets. Unless you really need the cigarette pack small size of the Canon PowerShot ELPH 510 HS or are willing to go larger and bulkier with the Canon Powershot G12, Nikon COOLPIX P7100, or Panasonic Lumix LX-5, the Canon Powershot S100 is a no-brainer “David’s choice” for 2012.